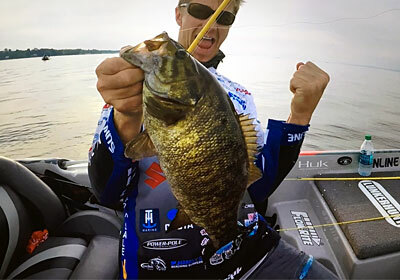 Bassmaster Elite Angler Chad Pipkens celebrates another great Oneida Lake smallmouth bass on the way to his Northern Open Top Ten finish! Chad Pipkens gets his first Top Ten of the 2017 Bassmaster season during stop #1 of both the Northern Opens and the Northern swing of the tournament season! His three day total of 49 lbs. 5 oz. gives him a 7th place finish at the Northern Open #1 at Oneida Lake in New York, earning him $8,448 to pad to his growing bass tournament career total!